OLD AQUINIANS HOCKEY CLUB – FREQUENTLY ASKED QUESTIONS ON FEES. What do my hockey fees go towards each season? Your fees contribute to a wide variety of expenses that occur as a result of running a hockey club. These include things such as Hockey WA affiliation fees, player insurance, club-house maintenance, turf management, equipment and trophies to name just a few. 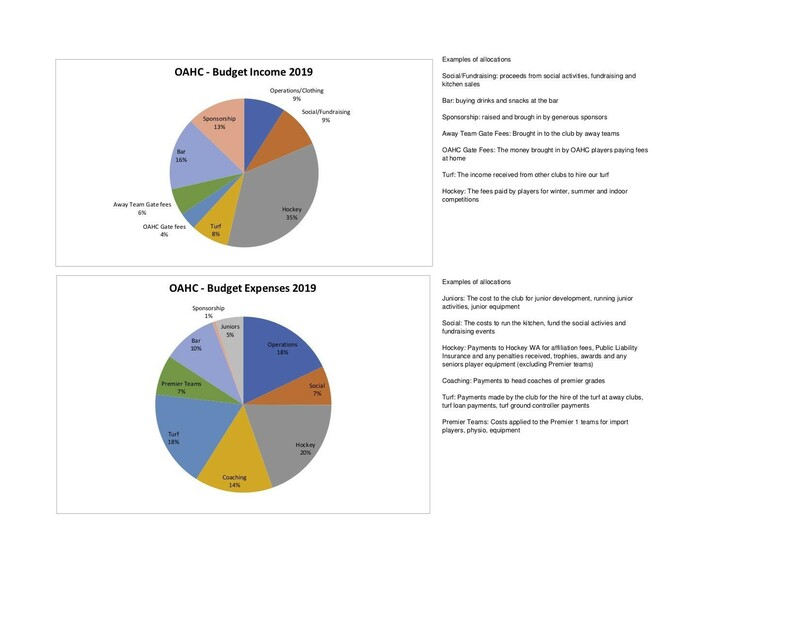 Below is an estimated breakdown of what your fees are used for. 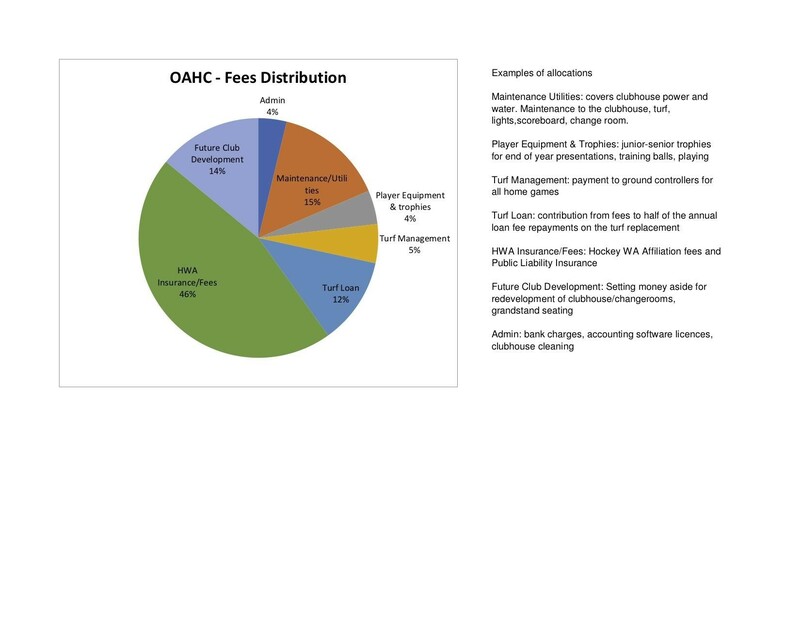 How much are OAHC fees in comparison to other clubs? Our club has one of the lowest fee structures in the competition. Do all members pay the same fees? No. We have different membership categories for juniors, students, seniors, volunteer coaches and goal keepers. Refer to our fees page on our website, and the Fees Policy for further information. When do I need to pay my fees by? All players must pay their fees in full by the 15th of May. Any players that fail to pay their fees by the due date shall have a $50 penalty applied on top of their playing fees if you have not started an agreed payment plan with the club. I can’t commit to playing a whole season, but would like to play some games – do I have to pay full fees? The club recognises some players play part-time due to work or other commitments. The Fee Schedule will accommodate part-time players. How much money does the club collect from fees and what other income sources are there? The club collects approximately 35% of its income each year from fees paid by its members. The remaining 65% comes from other sources such as the bar, sponsorship, fundraising and gates fees paid by other clubs who play or hire our turf at Aquinas. Below is an estimate of the club’s income sources for the year. Are there other expenses that the club has that aren’t covered by fees? Above is an estimate of the club’s total expense categories for the year. Does the club make a profit each year? The club aims to make a small profit each year. Each year we put a certain allocation (approx $20,000 p.a.) into a “sinking fund” to pay for future planned maintenance and capital works. This is generously matched dollar for dollar by Aquinas College. This is how we have had a significant amount of money to contribute to the turf replacement that has just occurred. How much did the turf replacement cost and how was it paid for? A lot! The turf replacement was more expensive than we had planned for, due to an inferior material being used for the turf basecourse, by the original contractor. While some money was able to be recovered through legal proceedings, it was not nearly enough to cover the full cost of replacing the basecourse. After the combined Club and College sinking fund contribution, and a very significant and generous contribution from the College, there was a residual $250,000 to be covered by the Club. The donations provided by our players and supporters have raised enough to cover 43% of this amount as at end of Jan 2019. See https://reds.com.au/turf-donations/ for more information. We are very thankful to those who have contributed. Tax-deductible donations are still accepted. The remaining expense of $142,500 has had to be financed via a loan. This is a new expense and the club aims to retire this debt within four (4) years. General life expectancy of a turf with high volume usage such as ours is 10-15 years. Therefore we must plan for this financially by continuing to maintain a sinking fund each year. Why has the club introduced a turf fee for Aquinas teams when they play at home? The club has had to take a loan to pay for some of the recent turf replacement costs and as such the Committee has had to look at ways to raise funds to repay this. If we kept the current fee structure as is, we would have no opportunity to repay the debt and keep putting money into the sinking fund for future turf replacement. We looked at what other clubs did who were in a similar situation, and most have a home turf fee policy in place. The Committee felt this was the fairest way for our club to raise the additional funds required over a number of seasons from members who were benefitting from the turf. It also creates a fair user-pays situation for turf players as opposed to grass players. When I register online for the 2019 season I now have to pay a fee to register – why is this? This Hockey Australia fee is compulsory and all members must undertake the registration and fee payment process prior to their first game to be eligible for selection to play for OAHC. Engage recreational hockey consumers to grow participation of the game, including through new game formats. Drive sport entertainment events that capture the nation’s imagination and raises awareness of the game. These include the introduction of the Pro League, a revitalised Australian Hockey League and other events. Unlock “One Hockey” with all state and territory bodies working together to deliver efficient, relevant and streamlined services across Australia. Become digitally agile with contemporary digital assets that give players, spectators and partners instant access to relevant and engaging content.